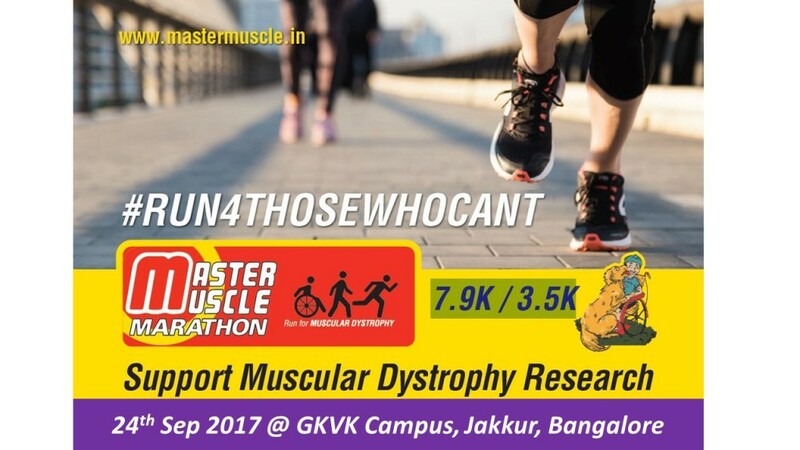 The “Master Muscle Marathon” is an initiative of DART (Dystrophy Annihilation Research Trust ) NGO to create awareness about muscular dystrophy disease and the trials faced by children all over the world. DART has launched a comic series based on Karan, a young boy with Muscular Dystrophy who will turn into a neighborhood superhero in the Master Muscle series who helps people in need. “Master Muscle Marathon” will be the first of its kind & an annual run from DART with an objective to create awareness among common people and use the opportunity to raise funds required for our Research. DART NGO is not funded by any government agencies and we welcome you with your friends, colleagues and family to come and participate to be part of this initiative to find a cure for this life-threatening disease. Our special invitation goes to “Person with Disabilities” including Paralympic athletes, Blade runners and children from special schools. Muscular Dystrophy (MD) is a group of Genetic Diseases characterized by progressive weakness and degeneration of skeletal and voluntary muscles which control and support movement of body. It affects cardiac & respiratory functions and other vital organs as well over the period. This condition affects all the muscles of the body and the children gradually lose their ability to walk and subjugated to wheelchair mostly by the age of 8 onwards and do not live beyond their early twenties due to cardiac or pulmonary failure. It is estimated that , Over 500,000 Children are affected in India without any “Cure” in sight. Dystrophy Annihilation Research Trust (DART) is parent founded and funded organization in 2012 with the aim of providing solace and support to the families of children with Duchene Muscular Dystrophy (DMD). DART has set up a research facility to develop a cure to eradicate this dreadful disease. One of our main objectives is to bring awareness and treatment of DMD to the masses and in concordance with this we conduct various awareness events throughout the year.